Let’s face it, dollars for education are harder than ever to come by. Referendums for more funding fail more than pass, yet our student population keeps growing. How can you gain the extra teaching areas you need in your school without breaking your budget? The answer is to use Portable Room Dividers. Technology is a wonderful thing and in no way is limited to the computer industry and its various offspring. Technological advancements are also prevalent in the manufacturing of school furniture and equipment. Case in point is Portable Room Dividers. It used to be that a Portable Room Divider was one that you had to either pick up and carry or drag across the floor. This would be cumbersome at best. 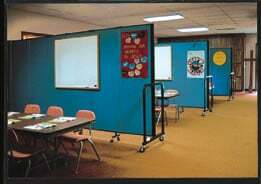 Today, the most popular type of portable room dividers are on casters. Casters allow the user to easily move the dividers anywhere in your facility. 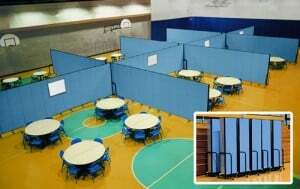 Additionally, portable room dividers are tackable, sound absorbing, and easily set up in any configuration to suit your needs. Add an optional markerboard to your divider for an interactive space. Furthermore, include a multi-unit connector on your divider to secure room dividers together to divide a larger space. Administrators have found a myriad of uses for this new educational tool: create temporary classrooms, art shows, backdrops for the play, hide ugly construction projects, before/after school programs, and more. Hence, if you want to make your facility do more for you without making a huge investment, view these images in ways many of your fellow administrators get it done with Screenflex Portable Room Dividers!